The Holiday Gift Exchange…..one way it Can Go Down…. Josephine loves her bridge group. Every month–sometimes more often–she gets to see and enjoy the company of friends completely apart from her work and family. No bills. No work deadlines. No office politics. Just friendship. Josephine is not so great at bridge, but it’s all about the companionship and fun. Although of course everyone has a different idea of fun. Some women like the wine. A few really want to win. Some enjoy hosting–Suzie is famous for her artichoke dip–others dread their turn. There is even a rumor of cheating at one of the tables…. Cheating or no, Josephine loves her friends and her girls night away from daily cares. And she also loves their name: A Bridge Apart. Although her name isn’t Josephine–you’ll see why in a minute–her story is true. 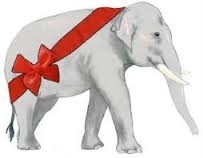 Every December the Bridge Apart does a white elephant gift exchange. Everything is holiday themed. The price limit is $35, it’s been inching up over the last ten years. Her first year Josephine didn’t know about the holiday theme, so they brought a sampler of chocolates around the world. It was a hit, but once she learned the rules, she followed suit. White elephants gifts are not Josephine’s favorite thing. It is the cost of admission to get to the friend part. This year–last week–she brought a candle with a pretty stand. It has holly leaves in the wax so you can just see them. Josephine drew a high number, so watched as the fun began. Frozen gourmet cookie dough. A pretty plate with a Christmas tree on it. Earrings that looked like little Christmas tree decorations. The “hot gift” this year–there’s always one–was a cashmere scarf made by the hostess. It had been stolen three times. One more time and couldn’t be stolen again. “The scarf is beautiful,” said Josephine, when her turn came. “But I’m allergic to cashmere.” She worried the little slip of paper with her number on it. Another Christmas plate? Didn’t I have three at home? The cookies look good. Too good. With some hesitation, Josephine picked her own gift, the pretty candle. No one said anything. At least she liked it. Whew. Another Christmas platter wouldn’t fit in her cupboard. Two days later Josephine was out and about, she needed more milk and bananas. And something for the guy who delivers the mail at her office. And it hit her–head slap–she still had the receipt for the candle. And so Josephine returned the candle and holder. One can always use a return to the credit card. This entry was posted in current events, entertainment, Friends, Life Experiences and tagged gift exchange, white elephant. Bookmark the permalink.